Mercury poisoning occurs when a person has ingested, inhaled, or had skin or eye contact with the toxic (poisonous) heavy metal mercury and suffers damage to his/her nervous system and other systems of the body. Mercury, which has the chemical symbol of Hg, is one of a few elements that are liquid at room temperature; and because it easily converts to gas form, it is extremely volatile. There are three forms of mercury circulating throughout the environment, and all three forms are toxic to humans and many other living organisms in varying degrees. Elemental mercury, also known as quicksilver, is mercury in its metallic (solid), elemental form. Elemental mercury is also referred to as mercury-zero. It is frequently found in the home in glass thermometers. It is also found in fluorescent light bulbs, thermostats, some pesticides, switches, preservatives, some paints, and in some dental amalgam fillings—although there are often mercury-free options available. In the past, according to a State of Michigan publication titled Mercury Poisoning, it was used as the active ingredient in ointments, animal worming medicines, antiseptics, disinfectants, diuretics and fungicides. Today, the publication states, it is present in seed fungicides, anti-slime fungicides used by the pulp and paper industries, by-products of burning coal, mining tailings (residue), and wastes from chlorine-alkali industries. In its solid state, elemental mercury is less toxic than some of its other forms, but is still very volatile. The most toxic effect of elemental mercury is when its extremely dangerous vapor is inhaled. This happens most likely in an industrial setting. Elemental mercury can be converted by bacteria into a charged ion (an electrically charged atom or group of atoms) known as mercury-two. There are two dangerous aspects to this form. First, unlike elemental mercury, it readily dissolves in water and combines with other ions to form new compounds. Also, bacteria can change mercury-two into one of mercury’s most toxic organic compounds, methyl mercury, which is easily soluble (capable of being dissolved) in water and thus finds its way into the food chain, where it poisons fish and other animals. Unfortunately, methyl or organic mercury accumulates in fish and many have such high levels that they become unsafe to eat. 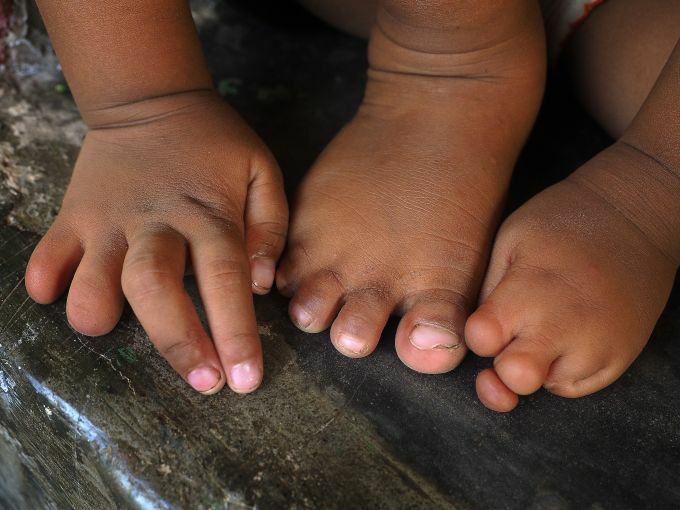 Methyl mercury is particularly dangerous for the developing fetus, babies, and young children. Pregnant women and women who may become pregnant need to be aware of the dangers of mercury exposure through eating fish. Inorganic mercury takes the form of various compounds known as mercuric salts. Mercuric salts are used in various folk medicines, particularly in some Chinese herbal preparations and in some Mexican remedies. Exposure to mercuric salts over the long term can cause kidney and nerve damage. Many people do not take the risk of mercury poisoning seriously because they have played with elemental or liquid mercury or broken thermometers containing mercury without ill health effects. While these “small” mercury exposures can appear to be free of detectable health consequences, even a small spill can have serious effects, including hospitalization and even death, if improperly cleaned up, if there is poor ventilation, or the mercury is exposed to heat. It is extremely important, therefore, that any mercury spill, even a small one, be properly cleaned up. If not, the home, workplace, and other people may be contaminated. This is because poisoning from elemental mercury is most likely due to inhalation of mercury vapors. The danger lies in the fact that after it is inhaled into the lungs in vapor form, mercury passes into the blood stream. This is an emergency that necessitates an immediate hospital visit. Inhalation of mercury vapor might happen in a factory where mercury is used. Most small household spills of elemental mercury are not dangerous if cleaned up sensibly. Elemental mercury usually passes right through the body if swallowed, so this is usually not poisonous to a person with a healthy digestive system. Elemental mercury is not easily absorbed by the skin, so touching elemental mercury is usually not enough to cause poisoning. But if elemental mercury is spilled in the home, from a broken thermometer or fluorescent light, for example, it must be correctly and carefully cleaned up. It should not be swept up with a broom or vacuumed, because this can break the mercury into small particles and spread it. 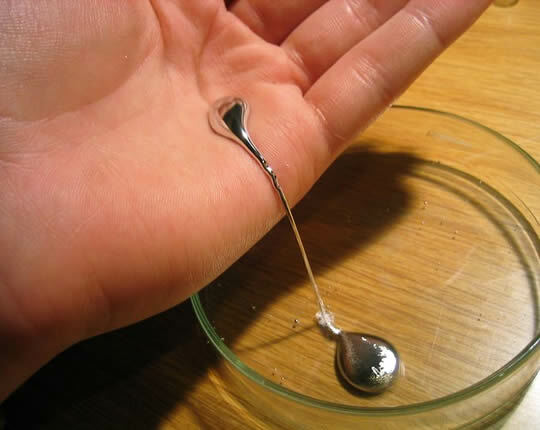 Spilled mercury should be sucked up with an eyedropper, scooped up with paper, or picked up with sticky tape. Then the mercury should be sealed in three layers of plastic bags and disposed of according to local hazardous waste procedures. Any clothes or rags that might have gotten mercury on them should also be discarded—not washed in a washing machine as this may further spread the mercury. The area of the spill should be ventilated for several days, if possible. Inorganic mercury, or mercury salts, have long been used in folk medicines. Exposure to inorganic mercury through folk medicines can cause poisoning. This can lead to kidney damage, tissue death, and nerve damage. Calomel, or mercurous chloride, and cinnabar, or mercuric sulfide, are two common toxic inorganic mercury compounds that should not be ingested. Folk medicines containing calomel, cinnabar, or other mercuric salts should also not be used on the skin. Several Chinese herbal medicines have been identified as containing dangerous amounts of mercury and arsenic. These are usually prepared as an herbal ball. Known Chinese herbal medicines to avoid are: An Gong Niu Huang Wan; Da Huo Luo Wan; Niu Huang Chiang Ya Wan; Niu Huang Chiang Hsin Wan; Ta Huo Lo Tan; Tsai Tsao Wan; and Dendrobium Moniliforme Night Sight Pills. 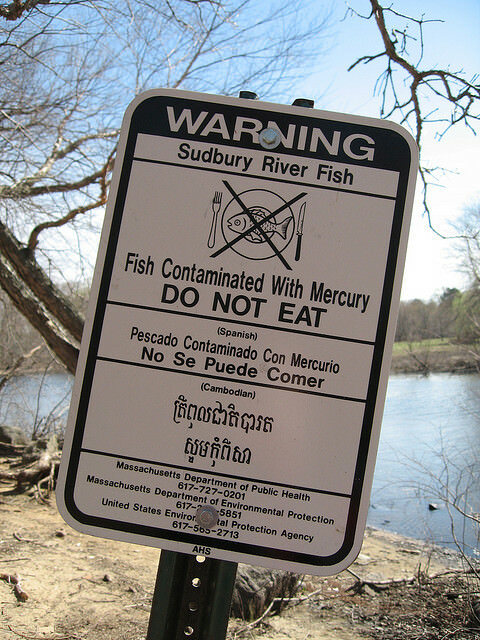 Poisoning from organic mercury is perhaps the most troubling form of mercury exposure. Organic mercury is widespread in the environment, and scientists and government regulators are uncertain how best to clean it up and how quickly to proceed. Some mercury finds its way into the atmosphere naturally, from volcanoes for example. But much of the mercury that finds its way into our food derives from industrial pollution. Mercury is emitted by power plants that burn fossil fuel and travels through the air. It deposits in bodies of water, where it is first taken up by plankton (floating animal and plant life). Fish that feed on plankton accumulate organic mercury in their bodies, and fish that eat those fish accumulate even more. This process, called bioaccumulation, concentrates the mercury in animals at the top of the food chain. Because mercury can travel great distances through the air, the problem of mercury pollution affects all of North America and is a global environmental problem. In the United States, the Environmental Protection Agency (EPA) is responsible for monitoring mercury emissions. In 2004, the EPA promulgated new rules on mercury emissions, which were criticized by some politicians and environmental groups as too lenient. The Food and Drug Administration (FDA), the United States government agency responsible for food safety, has revised its findings on the mercury in fish several times over the early 2000s. As of 2004, FDA guidelines recommend that pregnant women, women of childbearing age who might become pregnant, nursing mothers, and young children all limit the amount of fish they eat, because of the danger of mercury poisoning. People in these categories should avoid eating any shark, tilefish, swordfish, and king mackerel. They are all large fish at the top of the food chain, and they are the most likely to contain high levels of mercury in their flesh. People in these categories should also eat no more than one six-ounce can of tuna per week and should limit their overall consumption of fish to no more than 12 ounces a week. This translates to about two or three meals of fish or shellfish a week. The FDA guidelines also suggest that women and children should mix the types of fish they eat, and not eat the same kind of fish or shellfish for multiple meals within a single week. The FDA guidelines of 2004 did not address the problems of mercury exposure in people other than children, pregnant women, nursing mothers, and women of childbearing age. Some studies suggest that mercury exposures of up to four times the limits in the FDA guidelines may be safe for other people. There are many health benefits to eating fish, and the mercury level in any individual fish meal may vary greatly. So individuals not covered by these guidelines must use their own judgment on how much fish to consume. In addition, most states in the United States post warnings on consuming fish or certain types of fish caught in lakes and streams. Specific bodies of water or specific species of fish may have been found to be more dangerous than others. People who fish for sport or for subsistence should check with local government agencies about warnings on eating fish caught in their locale. Common home products that contain elemental mercury, such as lights, thermostats, thermometers, and appliances are not dangerous to humans unless they are broken, mercury is released, and there is exposure to mercury vapors because of improper cleanup. In June 1997, Karen Wetterhahn, 48, a Dartmouth College cancer research scientist whose specialty was dangerous heavy metals, died of dimethyl mercury poisoning, ten months after she spilled one to several drops of it on her rubber gloves while she was studying how mercury prevents cells from repairing themselves. Tests after the spill revealed that the mercury could pass quickly through the rubber latex gloves without damaging them. Three months after the spill, Dr. Wetterhahn experienced two episodes of nausea and vomiting. Two months later, she began losing her balance and having speaking and hearing difficulties. At the time she was hospitalized, tests showed 80 times the lethal dose of mercury in her blood. She then went into a coma until her death. The chairman of the Dartmouth chemistry department, John S. Winn, said, “I think all of us here at the chemistry department and colleagues of here in this area of research around the world have all been stunned that the gloves she was wearing at the time were not sufficient protection.” He explained that although methyl mercury looks like water, it is three times as dense and is readily absorbed by the body. He also said that about 100 laboratories around the world work with dimethyl mercury. Dartmouth officials in a letter to the American Chemical Society, urged those who work with dimethyl mercury to wear neoprene gloves with long cuffs and to have frequent blood and urine testing. Walter Crinnion, N.D. is a naturopathic doctor. He received his degree in Naturopathic Medicine from Bastyr University in Seattle,Washington, in 1982. Naturopathy originated in European health spas that emphasized hydro (water) therapy, massage, and nutritional and herbal treatment, and developed into a general philosophy of using the body’s natural healing capacity to avoid surgery and drugs. After opening a family practice, he began to specialize in allergies and treating chronic health problems caused by environmental chemical overload. He today operates a cleansing facility to treat chemically poisoned people, lectures at both naturopathic and allopathic conventional medicine) medical conferences and at several naturopathic colleges, and publishes in peer-reviewed journals on the topic of environmental overload. In 1963, a new filling for dental cavities, non-gamma-two amalgam, was introduced as a solution to conventional amalgam being prone to corrosion and mechanical weakness. Non-gamma-two amalgam quickly caught on, despite the fact that it caused a much-increased mercury emission, and replaced conventional amalgam. In the early 1980s, dentists were regularly using elemental mercury amalgam for dental fillings. However, dentists and other health professionals who had turned to holistic or alternative medicine began to publicize the toxicity of amalgam fillings and advocate their replacement with a non-toxic composite material. At first, the American Dental Association (ADA) denied there was any danger from mercury amalgam fillings. As evidence piled up, the ADA’s position became that the amount of mercury leakage from them wasn’t significant enough to be dangerous. In an article entitled “Environmental Medicine: Excerpts from Articles on Current Toxicity, Solvents, Pesticides and Heavy Metals,” Dr. Crinnion described his findings about the toxic aspects of elemental mercury amalgam dental fillings. According to Dr. Crinnion, silver amalgam dental fillings typically weight 1.5–2.0 g. Fifty percent of those filings is elemental mercury; and when studied, people with amalgam filings had mercury vapors in their mouths that were nine times greater than people without the filings. If the person with the amalgam filing chewed, the level of vapor increased six-fold, giving the people with amalgam filings vapor levels that were 54 times greater than those without amalgam filings. The level continued to increase as the people brushed their teeth or after they drank hot beverages. Dr. Crinnion described the effects of the pollution of Minamata Bay in Japan by methyl mercury and the neurotoxicity suffered by inhabitants of the area that came to be known Minamata Disease: ataxia (lack of normal coordination of voluntary muscles), speech impairment, constriction of visual fields, hypoesthesia (reduced capacity to feel sensation), dysarthria (slurred, slow speech from inability to coordinate mouth muscles), hearing impairment and sensory disturbances. As the mercury contamination spread, these symptoms did also. Forty years after the spill and almost 30 years since a fishing ban was put into effect in the area, problems continued predominantly in the fishing villages. Males complained of stiffness, poor ability to feel sensation, hand tremors, dizziness, loss of pain sensation, cramping, atrophy (wasting away) of upper arm muscles, arthralgia (pain in the joints), insomnia and lumbago (back pain). Females had significantly higher complaints of leg tremors, tinnitus (ringing in the ears or head), loss of touch sensation, atrophy of leg muscles, and muscular weakness. With regard to the implication of mercury in Alzheimer’s disease, Dr. Crinnion cites a 1998 study of cadavers and further studies where very high levels of mercury were found in the brains studied versus the control group; a study where rats were exposed to elemental mercury vapor at the same levels found in mouths of people with amalgams and lesions similar those seen in Alzheimer’s disease appeared. He also cites a published case history of a woman suffering from Lou Gehrig’s disease (ALS) who had 34 amalgam fillings removed and five months later she was found to have no evidence of motor neuron disorder. The symptoms of poisoning from inorganic mercury may include nausea and vomiting, abdominal pain, bloody diarrhea, and decreased urination. If inorganic mercury is applied to the skin, the skin may eventually redden or discolor. Skin contact with inorganic mercury can lead to nerve damage. The symptoms of nerve damage are weakness, numbness, and tingling. The symptoms of poisoning from organic mercury include fatigue, headache, depression, memory problems, hair loss, tremors, and/or a metallic taste in the mouth. These symptoms are also caused by many other common conditions, so organic mercury poisoning can be difficult to diagnose. A person who exhibits these symptoms and also eats a lot of fish might be more quickly suspected to have mercury poisoning. Measurement of mercury in the urine is the recommended method of diagnosing metallic and inorganic mercury poisoning. Organic mercury cannot be measured by urinalysis because it does not leave the body in urine. If the urine collection cannot be done over 24 hours, spot urine samples should be collected at the same time each day. Extent of exposure to organic mercury, including methyl mercury, as well as metallic and inorganic mercury can be measured by a blood test. Unexposed people usually have less than 2 MICROg/100mL of mercury in their blood. Early effects of toxicity are indicated when the blood concentration exceeds 3 MICROg/100 mL. It is worth noting that some herbal and folk treatments for health problems can be a source of mercury. The herbal preparations listed under the “Description” heading above are known to have large concentrations of inorganic mercury. A person prescribed a Chinese herbal ball preparation may want to ask the practitioner about mercury and be alert for symptoms of mercury exposure. Some Mexican skin creams and stomach remedies may also be sources of mercury. Fish oil supplements are a popular non-prescription treatment used by many people who hope to lower their risk of heart disease, lower their cholesterol, and improve mental function. Because in the United States, the manufacture of nutritional supplements is not regulated like pharmaceuticals are, fish oil supplements may vary greatly from maker to maker and so exposure to organic mercury from fish oil supplements is not readily quantifiable. It makes most sense for a person taking fish oil supplements to determine—if necessary by contacting the manufacturer directly—what kinds of fish are used for the oil, and if mercury levels have been tested for that brand. Alternative treatment—by a naturopathic physician, a holistic M.D. or osteopathic physician, or a homeopathic practitioner—is based on physical examination, biochemical testing, and an extensive history, including family illness. After evaluating all of this information, treatment may include a comprehensive diet tailored to the individual patient; vitamins, minerals, enzymes, amino acids and or homeopathic remedies tailored to the individual; removal of toxics from patient’s environment and diet; removal of amalgam fillings; necessary chiropractic adjustments; counseling; supplementary physical treatment; stress reduction and proper exercise; a stress-free home with help, if needed; a detoxification program; use of a sauna; and chelation, a recognized treatment for heavy metal poisoning, the intravenous injection of ethylenediamine tetraacetic (EDTA) that will chemically bind the heavy metal and allow it to be removed from the body in the urine. A person diagnosed with mercury poisoning may be prescribed a drug that binds the mercury, and thus helps the body excrete it quickly. The body naturally excretes mercury in the urine even without treatment. A doctor may recommend that a person diagnosed with mercury poisoning avoid eating any fish or shellfish. Further monitoring of blood and urine can determine whether mercury levels are falling. The nervous system, mouth, lungs, eyes and skin, target organs for exposure, should also be periodically checked. For adults, mercury poisoning is usually a reversible problem. The body can rid itself of mercury if the exposure to mercury is halted. Symptoms such as fatigue and memory problems seem to go away as mercury levels fall. However, for children and developing fetuses, mercury poisoning can cause long-term neurological problems. Mercury exposure before birth has been linked to lower intelligence and delays in learning motor skills. Avoiding mercury is the best way to prevent mercury poisoning. Folk remedies that may contain mercury should not be consumed or rubbed on the skin. People should follow local guidelines about eating fish caught in local waters, and should follow federal guidelines for consumption of commercial fish. Much of the scientific literature on long-term exposure to mercury from fish is still mixed. Eating fish has many health benefits, and one reason the FDA revised its fish guidelines several times was that it was afraid to scare people into avoiding fish altogether. In general, larger species of fish are more of a risk for high mercury levels. Canned tuna has less mercury than tuna steaks, because canned tuna comes from smaller fish. For the same reason, light tuna is also generally lower in mercury than white tuna. Common fish and shellfish that are considered low in mercury are shrimp, catfish, pollock, salmon, and light tuna.